With the festive season upon us, families are beginning to plan their holiday meals. Whether it’s the pies, mashed potatoes or the green bean casserole that make your mouth water, it’s easy to overindulge during holidays. Here are some tips to help you make healthy food choices. Consider preparing a healthy side dish to bring to the holiday table. Don’t fast until dinner time or you will likely overeat. If you eat a healthy breakfast you’re less likely to eat past the point of fullness at dinner time. 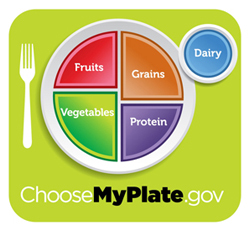 Think “MyPlate”. Fill half of your plate with fruits and veggies. Limit starches and grains to ¼ of your plate and choose a protein such as turkey for the other ¼. Drink water instead of sugary drinks. Consider flavored seltzer water or adding fruit and herbs to a pitcher of still water for the table. Balance nutrient dense foods such as fruits and vegetables with smaller portions of treat foods like cookies and desserts. Eat when you are hungry and stop when you feel full. Remember, you can always eat leftovers the next day. Get out and move around! The holiday season would not be the same without taking part in winter sports such as skating, skiing, building snowmen, taking brisk walks, or other physical activities. Don’t forget to relax! The holidays are for enjoying time with family and friends!